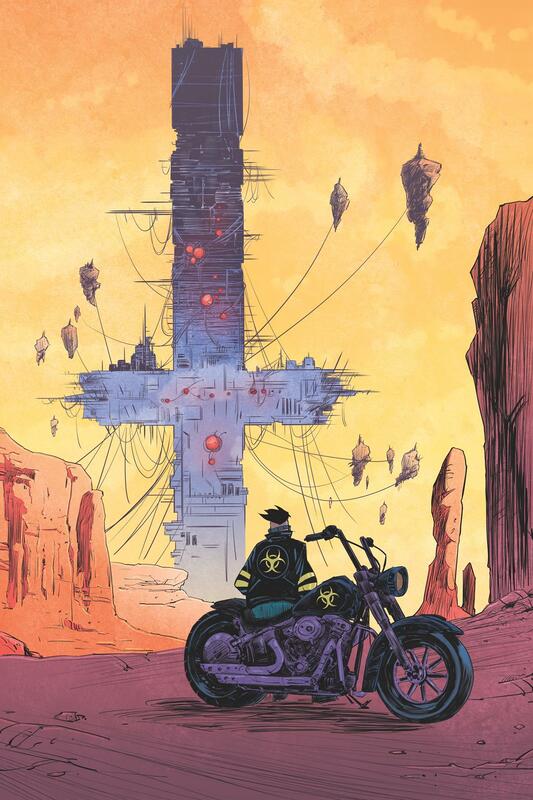 Writer Ryan Ferrier (D4VE) artist Alejandro Aragon (Robocop) and colorist Chris O’Halloran (Ice Cream Man) are headed back to the future — a post-apocalyptic, mutant infested, nightmarish future in Death Orb, a new miniseries from Dark Horse Comics. “We’re going off the rails with this one,” Ferrier said on Twitter. Follow Rider, a heartbroken, axe-wielding wasteland survivor in search of his wife and son as he cuts a bloody path across a war-torn country in the throes of a mysterious death cult led by Father, a demented idealist determined to rebuild the world in his image through the use of the deadly titular “death orb.” Along the way, Rider will face biker assassins, mech-suited mutants, and unspeakable depravity. Death Orb is a full throttle, no prisoners taken, ultraviolent tale of vigilante justice served hot! “Justice served hot!” Who can’t get behind that? The new title launches in October.